Posted on October 3, 2018 at 6:12 am. We begin today with an important announcement from APS! DON’T BE ALARMED… but you may hear some ALARMS this afternoon. The Federal Emergency Management Agency — aka FEMA — will be conducting a TEST of its Wireless Emergency Alert System — TODAY at approximately 2:18 p.m.
All cell phones and mobile devices connected to the internet and switched to receive “alerts” will start chiming loudly — even if they’ve been put on vibrate or silent mode. You’ll also receive a text message during the alert. But remember — it is ONLY A TEST, and the alert should be over shortly. Thanks for your cooperation! And now it’s time for WOLF PACK PRIDE!! The WMS Boys soccer team remains UNDEFEATED this season — following a convincing win at Kenmore Middle School yesterday: 3 to 1. And speaking of sports — Grab your frisbees, gentlemen! The start of the Boys Ultimate Frisbee Team is just two weeks away — beginning October 15th. Interested “spinners” are encouraged to sign-up on the activities board by the cafeteria. Whether you’re an old-pro or a first-timer — ALL are welcome! See Mr. Smolinski with any questions. LAST CALL for PE swag! Time’s almost up to order your WMS Hoodies, Sweatpants, or Long Sleeved T-Shirts! Order forms must be turned-in to your Health or PE teacher by this THURSDAY at the latest. Don’t get left out in the cold — order your Fall PE gear today, and Be a Part of the Pride! Hey 6th graders! Do you like puzzles, enjoy brain teasers, or crave mental aerobics? Then the “BrainStretchers Lunch Club” is for you! 6th graders are encouraged to check out this new “critical thinking” group — TODAY during your grade-level lunch. But space is limited, so 6th graders must sign-up on the activity board — or contact Ms. Edme in room 135 to participate. Get your thinking caps on and join BrainStretchers! Attention WMS MUNners! The Model UN club will meet this THURSDAY during ASP 1 in room 202. Participants are reminded to bring their Fall Commitment Form for the upcoming HAMUN conference. See Mr. Carlson with any questions. The Best Buddies Club will have its first meeting on FRIDAY during WOLF TIME in room 108. This inspirational club is your chance to really make a difference in our school — and with our amazing kids. Interested students from ALL grades are asked to stop by Ms. Rodgers room — number 108 — for a pass to the event and for more information. Thanks, Buddy!! 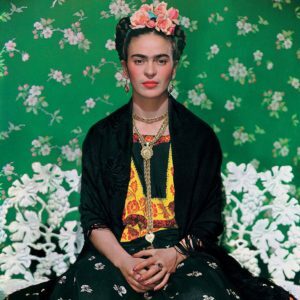 Meet Frida Kahlo — a painter of Mexican descent who “broke the mold” in the world of art. 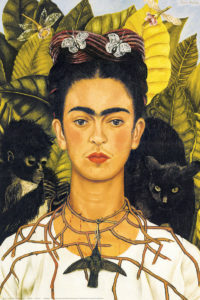 Born in Mexico in 1907, she is best known for her many self-portraits — which combined autobiographical elements with mixed realism and fantasy. But her story is much bigger than just a few pretty pictures. 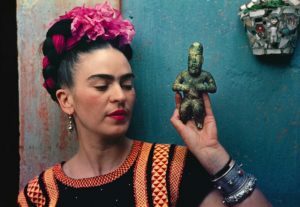 Throughout her life, Kahlo overcame poverty, illness, and discrimination on her way to becoming one of the most revered artists of her generation. She become an icon for feminism, the LBGTQ movement, and Mexican-American civil rights. 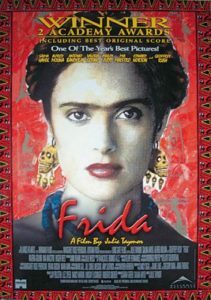 She is the first Hispanic woman to be featured on a US Postal stamp, and her life was the subject of an Academy Award-nominated movie, starring Salma Hayek. 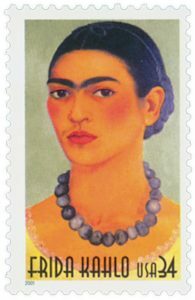 Frida Kahlo is truly a Champion of Change!